These are tough times for vinylites. If you buy a preamp or an integrated amplifier these days, chances are likely that it comes without a dedicated phono input. And if it has one, its sound quality often leaves us wanting. So off you go, splashing out more money for an outboard pickup preamp, which then of course costs unproportionally more, as it needs its own housing and power supply. But we have to live with the situation as it is, and anyway, with an outboard phono stage you'll have at least a fair chance that its designer knew what he was doing. And more, if you're a bit adventurous, you can always cut the tonearm cables short and put the outboard phonostage as close as possible to the turntable. The Trigon company is a descendant of the perhaps better-known but now-defunct German high-end electronics brand Restek. Until some years ago Restek was a sizeable manufacturer of a very serious range of amplifiers, tuners, and CD-players, some of them deep into esoteric price figures. And all of them, as befits audio from Germany, heavily chrome-plated... After the crash the same people restarted, perhaps a bit more modest, with this Vanguard phono preamp, and a small range of other amplifiers. With apologies to Norbert Lehmann, I can only describe the Vanguard as a small black, er, cube (a version with silver front is available too). Measuring 12 x 12 x 4 cm or so, it comes in a sturdy black steel case, with an 8 mm thick aluminium front plate. Its juice comes from a 27V DC wall-plug type of power supply, which incidentally did not properly fit the wall sockets here: I had to cheat and remove the socket's earth pin! At the bottom of the Trigon four banks of dip-switches are readily accessible, setting gain in 16 steps ranging from 40dB to 60dB, input resistance, also sixteen steps from 33 Ohms to 47kOhms, and input capacitance, again 16 steps from naught up to some silly figure. One thing is for certain: with the exception of ultra-low output moving coils, the Vanguard is ready to oblige to any exotic demand from your cartridge! Internally the 27V are regulated and then split into a +12V and a -12V side, with the ground reference dynamically maintained with an NE5534 opamp and associated transistors. The input signals are filtered with EMI-rejecting coils: definitely input from our Eurocrazy (pardon: Eurocracy). The gain stages themselves comprise of firstly flat gain in a low-noise LT1028 opamp (we don't see these very often! ), then a passive low-pass for the treble part of the RIAA de-equalization, and finally an NE5534 with the remaining RIAA part in its feedback loop. The capacitors are mostly MKS, i.e. polyester, some of them Wima-branded, and the output is direct-coupled. A bit of a surprise. A bit of a risk too: one channel of this preamp featured a high 200mV offset!!! For those who are into such trivia: the Vanguard's circuit seems to be directly derived from the phono stage of the older Restek Sector preamp, a preamp which back in 1992 cost EUR1500, and which had a reputation for a mediocre sound on its line inputs, and a magnificent sound on phono. The overall impression of quality this unit makes is very good, but I have to emphasize that both the high DC offset and the non-standard power supply plug are not acceptable and should be addressed by the manufacturer!!! I slipped this black box between my QC'ed and extra-damped Michell GyroDec with silver-wired Rega arm and Ortofon MC-25FL cartridge on the one hand, and the Michell Argo/Hera preamp with Quad 306 power and ESL speakers on the other hand. The Ortofon is a moving coil with a fair output of 0.5mV and a marked insensitivity to load conditions, so the Vanguard was set for 56dB gain and an input impedance of 100 Ohms // 100pF: more or less the same values as on my own preamp. The tonearm's earth tag was not used, and the Trigon exhibited no hum at all. Starting with Jennifer Warnes' delicious Famous Blue Raincoat collection of Leonard Cohen songs, the Vanguard surprised with a commendably full and powerful sound. The individual background voices in the acapella A Singer Must Die were very easy to follow, each in its own position (wide as well as deep! ), each with its own dynamics and inflections, and with Jennifer Warnes in front, intimate, as if she was there to tell us a secret. This phonostage also has fine rhythmic abilities, as this song swung like never before, and instrumentized tracks really had a lot of impact in the bass and drum department. At the same time, however, it was clear that the Vanguard's tonal balance was darkened, with progressively less detail and openness throughout the midrange and low treble, until at the very top end things started to sparkle again. All the other albums I tried consistently gave the same result: a rolling and deep bass, emphasising rhythms and also fattening the fundamental tones of voices and instruments alike so that each seemed to sound more delineated and more dynamic than expected. This all set in a wide and deep sonic vista (verrry appealing with large-scale classical music, especially on massed strings! ), a vista that somehow veiled from the midrange on. Stability was fine, handling of s'es and sibilance too, the Trigon never going aggressive or losing control. Despite those dull mids, resolution and transparency were quite good. Or rather, there was an abundance of transparency at the 'musical' level, meaning that all strands in the music were there and easy to follow, with their timing and inflections. But the transparency at the 'technical' or 'audiophile' level was lacking a bit. Which is strange, not? The overall tone was colourful, certainly lacking any form of false sheen or undue greyness. The unit wasn't entirely free of grain, wasn't as smooth as the best (but still better than average, having the texture of an arty black&white or sepia-toned film), but neither was this type of 'distortion' intrusive. No need to spend words on LFD now, you can always read my recent test of the Mistral Linestage and Powerstage. 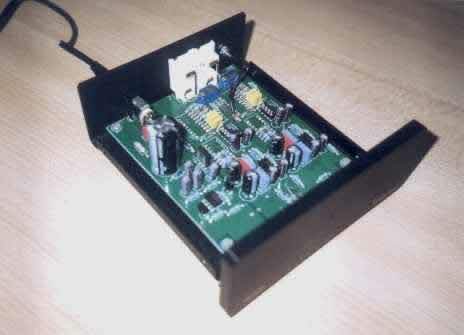 The Phonostage comes in the same style of housing, just as wide, but only half as deep. Meaning that this particular component will always need a prominent place in your equipment stack, and as such is not quite as handy and 'invisible' as the Trigon. This Phonostage is the economy-version of the LFD MM0 preamp, which, incidentally, I already tested back in 1995 if my memory serves me correctly. Compared to the MM0, the PS has a much smaller, EI-frame transformer, while the capacitors in the signal path now seem to be MKS types instead of the Wima MKPs (polypropylene) of its more expensive sibling. The circuit is identical, however: dual-mono rectification followed with 7812/7912-based supply voltage regulation. The gain block features only one element, an NE5534 opamp per channel, with fully-active RIAA de-equalization. The output is AC-coupled with an electrolytic capacitor. All of this looks cheap. In fact, with the exception of the odd tantalum resistor it is cheap, but I have reasons to believe that this particular implementation, and almost every component in it, has been selected by numerous listening tests to obtain a sonic result better than just the sum of the parts; this opposed to design by deaf analysis or by dumb text-book circuit synthesis. Where the MM0 could internally be configured for MM gain (x90 or 39dB) or MC gain (x680 or 57dB) by means of a switch, the same can only be achieved by soldering two jumpers in the Phonostage: clearly a job for the dealer. In both cases, MM or MC, the input resistance is fixed at 47kOhms: this is predominantly a preamp for moving magnets or high-output moving coils. The Phonostage is also available as a cheaper power supply-less board to be built into LFD and Mistral integrated amplifiers and preamps. Substituting the Mistral for the Trigon, the initial sound heard was rather thin and even a bit harsh: looking less than brand new I presupposed that the Phonostage already had been extensively used by its distributor, but apparently this was not the case (the guy really ought to get a decent turntable!). I then left on the Phonostage for a few days before listening again, during which time it indeed sweetened completely. After that, and again cross-referencing to the Vanguard, the Essex-sourced preamp treated me with an elegant and smooth sound, more neutral than its German colleague. Indeed, just neutral, period. The Mistral is smooth in the sense that it sounds coherent from top to bottom (with the exception perhaps of a very slight greyness of the treble, probably that NE5534 running out of steam), with a refined and silky character and a tinge of polish around individual instruments. Talking about instruments: separation between various sound sources is wonderful, especially laterally. Depth seems to be less than the Trigon's exaggerated sense of ambience, but still without reverting to a flat picture, though. Overall the Mistral played with more air, more openness, but also with less explicit dynamics (not that it was bad in this area, not at all! ), perhaps a bit bland, and with a certain agility to portray what is going on in the music, when, and where. It showed much better the differences between records and recording styles, where the Trigon worked more as an equalizer, imposing its own character onto the source. When you already own an LFD integrated amplifier or pre-amplifier then this phonostage is a must, provided you buy it as the in-built add-on board. As a stand-alone unit, the Mistral is rather expensive in materials terms, but especially with MM cartridges and high-output MCs (I am thinking now of the Goldring 1022 and 1042 and their Reson clones, Dynavectors, Van den Hul MM-1 and MM-2, Benzes, and other gems...) it may well perform at a sufficiently high level to entirely justify its cost. After all, its unfuzzy smooth neutrality is something to be heard! Once more, LFD proves that simple is best when it comes to audio electronics. 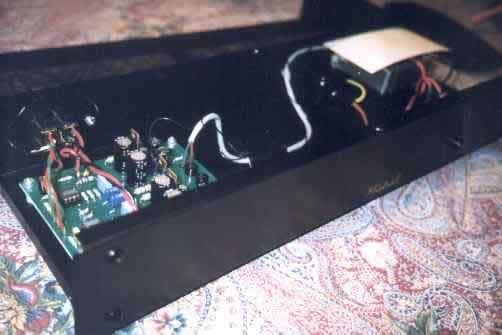 I liked both phono preamps. The Trigon for its drama and warm-analogue feeling, the Mistral for its silky neutrality. As such both of them come recommended in one way or another. When all is said and done, both my GyroDec and me still wish for something better, something with a sound one can imagine as being built from the good properties of the units tested here, but entirely devoid of any less-attractive characteristics. And the Mistral comes closer to such a thing than the Trigon.